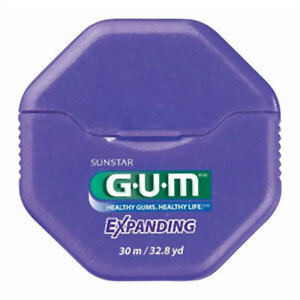 An innovative floss that expands to thoroughly and gently remove plaque from between both tight spaces and wide gaps. Compressed and lightly waxed for easy insertion between tight spaces. Expands during use to clean wider gaps. Expanded floss spreads across the tooth and covers more surface. Expansion reinforces a job well done and makes flossing fun! Texturized nylon fibers are soft and comfortable to use. Ideal for people with tooth and/or gum sensitivity and gum recession. Preferred by hygienists over Oral-B® Ultra Floss® !